As the brand ‘Sara Realty’ is relatively new for audiences, we needed to increase engagement and followers for the their project Kshipra, Sanpada, on their Facebook Page. Festive seasons often garner the maximum engagement as people are always on the lookout for festive offers on various products, which made Ganesh Chaturthi the apt occasion. 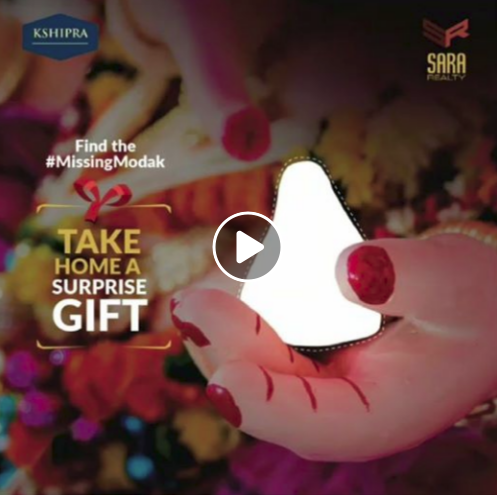 The aim of the campaign was that the participants had to find the #MissingModak on the website, share the screenshot, like the Facebook page and also tag their friends. Based on the humongous engagement received, we evaluated our audiences based on replies & engagement levels on the Facebook page. The winners were eventually announced & presented with Amazon Gift Vouchers. To establish a compelling brand presence on social media, get in touch with us. Futurescape Advertising is one of the leading advertising and digital marketing companies based in Vashi, Navi Mumbai.